Using mobile technology, data collection can be carried out anywhere, even if there is no internet signal. Once your data is collected, syncing with the Internet Server will upload your data so that it is published on the web to be seen by your target audience. The demand for Mobile PDA (Personal Digital Assistant) or hand-held Applications (Apps) has increased dramatically over the last few years as businesses recognize the importance of being able to collect and report on data whilst on the move. Intelligent use of hand-held devices, the internet and databases together improves efficiency in your business. Connecting to the internet transforms the process of reporting, saving time and money. Much data collection today is still carried out using paper and then entered manually into a computer at a later date. With our software you'll just need to enter the data once, so it will help reduce your costs and time spent. It will also help improve your data efficiency which in itself will reduce your costs. 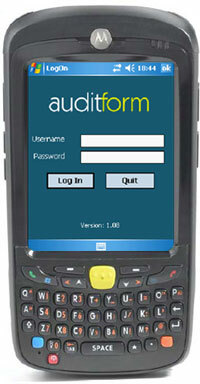 We have used this technology with our AuditForm development where a Microsoft mobile enabled PDA is used to collect the audit data as defined by the web site. This allows auditors to go around premises using the hand-held device, collect photographs, signatures and audit data in an efficient way using a device that is easy to manage, and then upload the completed audit to the internet for further analysis and follow-up. Using a PDA solution also allows you to capture data using intrinsically safe devices. So you are able to go to areas to capture data that would otherwise require a pen and paper data collection method (which isn't very easy in bad weather!). The synchronisation can later be carried out off-site. If you have specific requirements just give us a call on +44(0)161 447 8845 or click here to fill in a request on our contact page and we will get back to you as soon as possible. Intelligent use of hand-held devices, the internet and databases together improves efficiency in your business. Providing meaningful business reports with text, photographs and signatures enables better analysis and follow-up.